What made me want to watch Despicable Me 2 with 2 little kids is the teaser music video of 2 potato head minions singing the Banana song “banana-babanana…” last year. The music vid didn’t fail me. There were several entertainment numbers from the minions throughout the movie. These include their own rendition of “I Swear” by All 4 One and “YMCA” by the Village People. But other than the musical numbers, there were countless other reasons why anyone will love this film. Sure, it isn’t spectacular or explosive but numerous comic antics will have you exploding in laughter. Even kids will do. If you love spy adventure, then you’d appreciate high tech gadgets and cool cars featured in this film too. The cast and characters are effective with their roles. You’d never guess who’s behind the voice as each cast was able to portray their role well. Plus, if you’ve watched the previous movie where the villain Gru found a soft spot in his heart through orphans Margo, Edith, and Agnes; a new development comes in this sequel through Lucy Wilde, Gru’s love interest. She is his partner as a new recruit for the AVL or Anti-villain League. In this sequel, Gru gets recruited by the Anti-Villain League due to his exceptional talent when he was a villain. Their mission is to recover a chemical compound capable of transforming any living thing into a monster/killing machine, destroying or ingesting anything in its path. Gru become partners with Lucy and both had developed an interest for each other. However, upon capturing the alleged culprit who supposedly was behind stealing the chemical compound in question (Floyd Eagle-san), Lucy was reassigned to Australia. She had a change of heart of course, seeing only Gru in everything so she headed to the Cinco de Mayo party at Eduardo’s (through a daredevil acrobatic mid-air antic jumping off the plane in a high tech wing), only to be held captive by the former villain El Macho who was actually behind the whole drama. He even transformed hundreds of abducted minions into his evil army. But Gru saves the day with the help of his kids and Dr. Nefario who previously left the team, (who are now business people involved with jellies) to pursue a new career, the evil he clamored for through El Macho. Dr. Nefario used the jellies which the minions despise and mixed it with an antidote to help revert the affected victims to their former minion selves. At the end of the film while credits rolled, a potential sequel may be on its way with the Minion Movie as possible topic. But before that, if you haven’t seen this movie yet, you should. 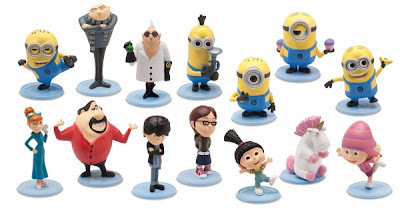 Young or young at heart, you will definitely love Despicable Me 2!